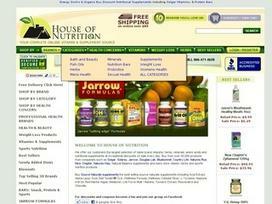 House of Nutrition sells a wide range of vitamins and supplements used for various purposes. The many nutritional products stocked by the online store are useful for acne, allergy, joint problems, memory enhancement, inflammation, and numerous other ailments and problems. Health and beauty products can also be purchased from House of Nutrition along with a number of sports nutrition items. Professional as well as renowned brands are available at House of Nutrition. Headquartered in Westchester County, New York, it started operations in 1991. The competitive product pricing and the efficiency of each product resulted in its success within a few years. Carol Lombardo, the company's health practitioner, is a veteran in the field of Alternative Health and has helped in the development of numerous products that are beneficial to users. Supplement enthusiasts get the best advice regarding the choice of vitamins and supplements along with a host of products that can be used for various purposes. Customers can make use of numerous search tools for finding appropriate products. Shoppers can browse through different product categories on the basis of brands such as Jarrow Formulas, Nature's Plus, Solaray Vitamins, New Chapter, and numerous others. Different product categories consisting of Probiotics, Fish Oils, Vitamins, Hair, Nail, and Skin Products, etc., can be collected from the online store. Apart from these, products are separately categorized according to their popularity, top 30 brands, sports nutrition, professional brands, health and beauty, vitamins, and supplements. Products that are popular and are constantly being ordered are separately displayed in the Blowout section. The House of Nutrition website makes shopping easier and more convenient with its search engine, which looks for products according to specified names. Registration is not required for shopping. House of Nutrition sells a wide array of products. Professional brands such as Allergy Research, Biogenesis, Klaire Labs, Douglas Labs, Herb Pharm, etc., sell their products at the online store. Some of the most popular brands sold from the store are American Health, Flora Supplements, Nature's Plus, Avalon Organic, and others. The competitive prices help customers incur savings on purchases. Brands such as Rainbow Light offer supplements that help in digestion and absorption. The company stocks over 40,000 products manufactured by renowned brands and merchandise such as Jarrow's Immune Soothers, Robert's Blue Ice Leg Gel, Nature's Plus Source of Life Women's Multi-Vitamin, Tea Tree Therapy's Soap, and many more. House of Nutrition is dedicated to offering the best quality vitamins and supplements to all customers. Orders can also be placed over the phone, and House of Nutrition accepts payments by all major credit cards, PayPal, checks, and money orders. Share what you think about House of Nutrition, and your favorite ways to save there!